You are also advised to intensify the mass mobilization. In the past, the employees had to wait for 19 months for the implementation of the Commission’s recommendations at the time of 5thCPC, and for 32 months at the time of implementation of 6th CPC. However, this time, 7th CPC recommendations are being implemented within 6 months from the due date. · Gratuity ceiling enhanced from Rs. 10 to 20 lakh. The ceiling on gratuity will increase by 25 % whenever DA rises by 50 %. NJCA will meet at 04:00 PM on 30th June 2016 to decide future course of action. Continue in full swing mobilization for indefinite strike from 11th July 2016. NJCA MEETING HELD TODAY (25.06.2016) FORENOON. DECIDED TO GO AHEAD WITH INTENSIVE PREPARATIONS FOR MAKING THE INDEFINITE STRIKE FROM 11th JULY 2016 A THUNDERING SUCCESS. DETAILED NJCA CIRCULAR WILL FOLLOW. 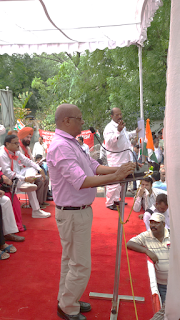 A massive parliament march and rally of about 20000 Central Government Employees was held at Jantar Mantar, New Delhi on 24th June 2016. The rally was organized by National Joint Council of Action (NJCA) of Central Government Employees comprising Railways, Defence, Confederation and Postal organizations demanding modification in the recommendations of 7th Central Pay Commissions including minimum wage and fitment formula. Other demands are scrapping of New Contributory Pension Scheme, No FDI in Railways and Defence, Grant of Civil Servant status to Gramin Dak Sevaks, filling up of vacancies, enhancement of bonus ceiling, No outsourcing, downsizing, contractorisation and corporatisation etc. 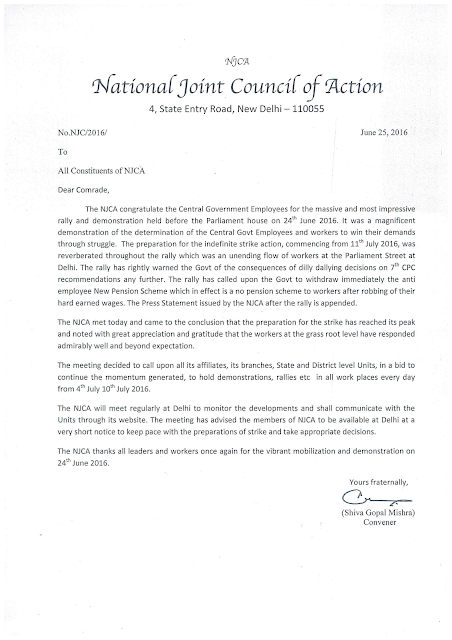 The NJCA had already given strike notice to Government on 9th June 2016. The Modi Government is not ready for a negotiated settlement with the staff side. The rally called upon the entirely of Central Government employees to intensify the campaign and preparations and make the strike a total success. About 33 lakhs Central Government Employees will participate in the strike. 40 lakhs Central Government Pensioners have declared their solidarity with the strike. Central Trade Unions had also extended their full support. State Government Employees Federations have cautioned the Central Government that they will also be compelled to join the strike if Government refuse to settle the demands relating to 7th CPC recommendations as majority of the state Governments are implementing the Central pay parity to their employees also. ONE DAY PAID WEEKLY OFF FOR CASUAL WORKERS-IMPLEMENTATION OF THE HONORABLE CAT, AHMEDABAD BENCH IN THE OA NO. 214 OF 2003 FILED BY MRS. BHIKABEN PRATAPBHAI PRAJAPATI- SEEKING COMMENTS ON DRAFT O.M. CLICK THE LINK BELOW TO VIEW. More than 32 lakh Central Government Employees working in various ministries of the Government of India. including Railways, Postal, Defence (Ordinance Factory and other Civilian Employees), Central Secretariat, Income Tax, Audit & Accounts and other employees of the government departments are aggrieved since long on non-settlement of their various demands. The report Of the Vll CPC has further made them aggrieved because of the retrograde recommendations, including non-scientific calculation of Minimum Wage and Fitment Formula. The issue of National Pension Scheme (NPS) had been very heartburning for more than 1.1 million young Central Government Employees who have been deprived from the Defined Pension/Family Pension and we are agitating this issue with the Central Government since its inception. The Central Government Employees of this country have always stood for the development and good governance of the country. but do feel de-motivated because of the inaction on their pending demands. 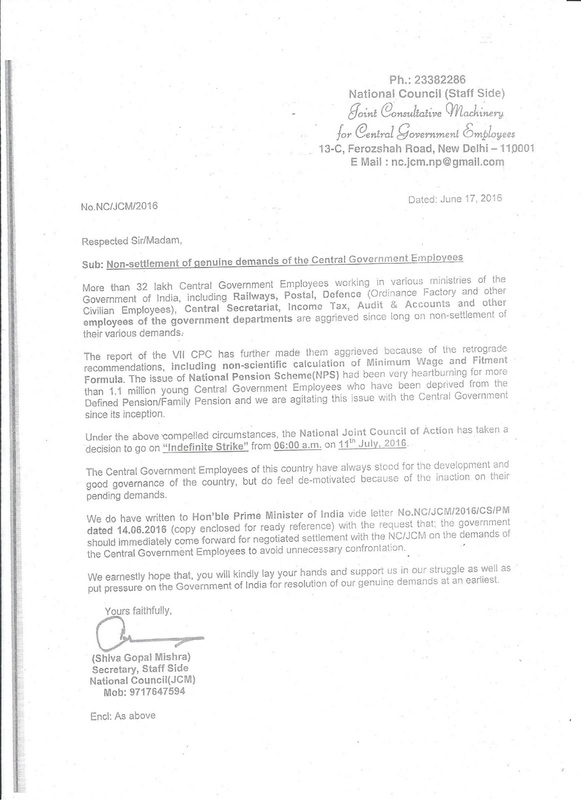 we do have written to Hon’ble Prime Minister of India vide letter No.NC/JCW2016/CS/PM dated 14.06.2016 (copy enclosed for ready reference) the request that. the government should immediately come forward for negotiated settlement with the NC/JCM on the demands of the Central Government Employees to avoid unnecessary confrontation. All Affiliates and C-O-Cs are requested to ensure maximum participation especially from Delhi and nearby states. The National Joint Council of Action was formed as an apex level organization of the under-mentioned Associations/Federations participating in the negotiating body of the Central Government employees at the National level, called the Joint Consultative Machinery. 1. All India Railway men Federation. Unions and Associations in all Departments other than Railways and Defence. 7. Federation of National Postal organizations. It was formed in the wake of the then UPA Government refusing to enter into any meaningful negotiations with the Employees Federation. In the face of the unprecedented rise in the inflation of the Indian Economy during 2006 -16, the employees demanded the Government to effect wage rise for the emoluments fixed on the basis of the 6thCPC was incapable of meeting the both end of an employee especially at the lowest level. Though under threat the then Government conceded the demand for setting up of the 7th CPC, they stubbornly refused to grant any interim relief or DA merger, which alone would have mitigated the difficulties of the low paid workers When the NDA Government came to power, the NJCA approached them also with a request that the difficulties of the low paid workers in Central Government must be appreciated and the demand for Interim Relief or DA merger be conceded. The NDA Government too did not respond to the plea made by the NJCA. The 7th CPC which was set up in Feb. 2014 was to submit its report in August, 2016. However, at the intervention of the Government, the report was further delayed and it ultimately reached the Government only in November, 2015. Their recommendations were to be effective from 1.1.2016. Except setting up an empowered Committee of Secretaries, the Government did not do anything so far on the report. It is now more than six months the report is with the Government. Normally the revised allowances which form part and parcel of the salary of the employees are granted with prospective effect i.e. from the date of the issue of the orders. The delay in taking decision on the report will rob the employees of the increased allowances for ever. This apart, the report of the 7thCPC was totally disappointing as it did not address any of the issues projected before them in a proper manner and most of the demands were rejected sans reasoning and logic. The increase they recommended was a paltry 14%, the lowest any Pay Commission had ever suggested. The NJCA in a detailed memorandum submitted on 10th December, 2015, conveyed to the Government as to how the recommendations on all major issues were bereft of logic and reasoning and suggested as to what improvements were required thereon. 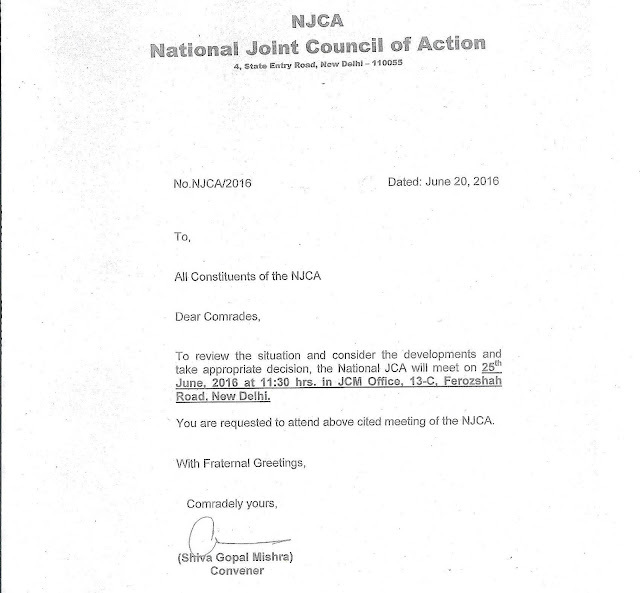 The NJCA had been pursuing to have a meaningful negotiation and settlement of the issues. Except hearing the leaders, the empowered Committee did not go further. It acted as if it was powerless and the final decision will have to be taken by the Government. At the request of the Cabinet Secretary on Ist March, 2016, when the NJCA deferred the strike action which was to commence in April, 2016. 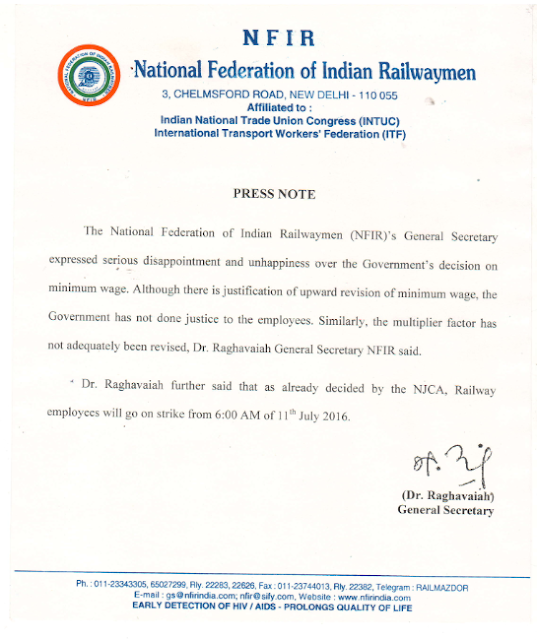 As there had been no fruitful negotiations or discussions and having realized that the Government has no intention to settle the Charter of demands, the NJCA decided to serve the notice for an Indefinite strike action on 9thJune, 2016. Accordingly, all the constituent organizations have served the strike notice today to their respective heads of Departments. The indefinite strike will commence on 11th July, 2016, if no satisfactory settlement is brought about on the charter of demands (which is enclosed). About 35 lakh workers and employees belonging to various Departments of the Government of India will participate in the strike action, which is to commence on11th July, 2016. It will certainly be the largest participated strike action of the Central Civil Servants of the country since its independence. The determination of the Minimum wage on the basis of Dr. Aykhroyd formula enunciated in 1957 to which the Government of India was a party is the most significant issue in the charter of demands. A right settlement thereon will have far reaching impact in the wage determination of the entire working class in the country. The confrontation is between the forces who wanted India to be the destination for cheap labour and others who fight against the exploitation. The new Contributory Pension scheme introduced by the Government in 2004 has made one third of the Civil servants unsure of their entitlement at the evening of their life even though they were to contribute huge sums from their wages every month compulsorily. The PFRDA bill became an Act in the country as the members of Parliament both belonging to NDA and UPA voted in favour of the loot of the workers. Even the recommendation made by the Standing Committee of the Parliament to provide for a minimum guaranteed annuity pension was rejected when the Bill was passed. The other issue which must have a satisfactory settlement in the charter of demands is about the contributory pension scheme. There was perhaps only one and only one positive recommendation made by the 7th CPC. That was to give some relief in the pension entitlement of the past pensioners. The Government has now proposed to reject that recommendation on the specious plea that the relevant records required for the verification of the claim of the individual pensioners especially those retired long time back may not be available with the Government. If the Government chooses to accept such also untenable advices from whichever quarter it emanates, it would not only be unfortunate but will make the strike action an imminent inevitability. 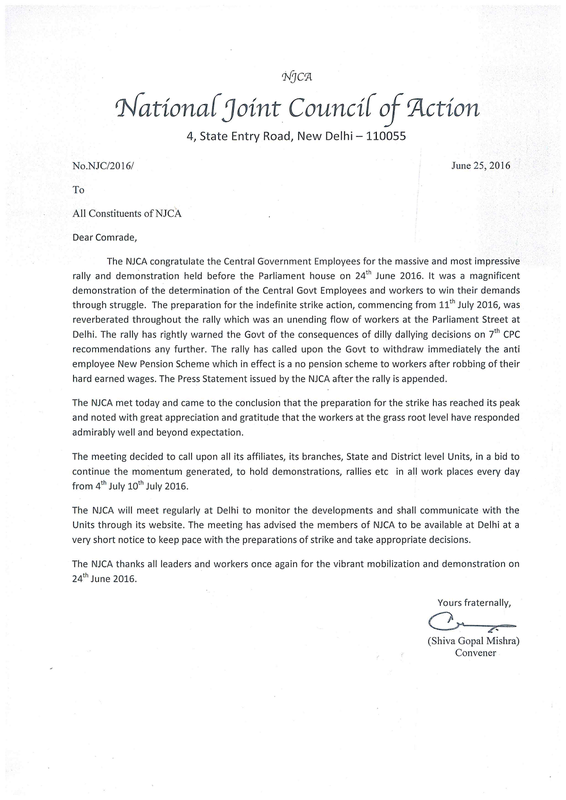 While the NJCA hopes that the good counsel will prevail upon the Government to avert the strike action, it appeals all its constituents and through them all Central Government employees to go ahead with the preparation of the strike action, which is slated to commence from 11thJuly, 2016 with courage and determination. 1. Settle the issues raised by the NJCA on the recommendations of the 7 CPC sent to Cabinet Secretary vide letter dated 10th December 2015. 4. i) No privatization/outsourcing/contractorisation of governmental functions. ii) Treat GDS as Civil Servants and extend proportional benefit on pension and allowances to the GDS. 2. The adoption of 12 monthly average of the retail prices is contrary to Dr. Aykroyd formula. Same is the case with the reduction effected by the Commission on housing and social obligation factors. The house rent allowance is not a full compensation of the expenditure incurred by an employee for obtaining an accommodation. Therefore, no reduction on that count in arriving at the minimum wage is permissible. We may cite the minimum wage computation made by the 3rd CPC in this regard, The employees were in receipt of HRA even at that time. But still the 3rd CPC, and rightly so, adopted the 7.5% as the factor for housing. In respect of the addition to be made for children education and social obligation as per the Supreme Court judgement, (25%) the Commission has reduced the percentage to 15% on the specious plea that the employees are separately given children education allowance. The Children education allowance is not a full reimbursement of the expenses one has to incur. After the liberalization of the Education Sector where private parties were allowed to set up universities and colleges, the expenses for education had increased heavily . No concession or allowance is granted to the employees for educating the children beyond the higher secondary levels. The earlier Pay Commission has only tried to compensate a little in the increasing cost of education and that too at the primary level, since even the Governmental institutions had started charging abnormal tuition and other fees. 3. The website maintained for the Agriculture Ministry depicts the retail prices of commodities which go into the basket of minimum wage computation. Even though the rates quoted by them vary from the real retail prices in the market, it provides a different picture. If one is to take the rates quoted by them for different cities and make an all India average of the prices as on 1.7.2015, it will work out to Rs. 10810. It will result in the computation of the minimum wage of Rs. 19880. Adding 25% for arriving at the MTS scale, it will rise to Rs. 24850. To convert the same as on 1.1.2016, 3% will be added as suggested by the 7th CPC. The final computation will be Rs. 25,596, when rounded off shall be Rs. 26000. 4. The Andhra Pradesh State Pay Commission in its report has taken the commodity prices at Rs. 9830.- as on 1.7.2013 which works out to a minimum wage of Rs. 18080. The wage of MTS will then be Rs. 22600 as on 1.7.2013, The Corresponding figure for 1.1.2016 shall be Rs. 26758 , rounded off to Rs. 27000. 5. The Staff side had computed the minimum wage as on 1.1.2014 at Rs. 26,000, taking the commodity price at Rs. 11344. The rates were taken on the basis of the actual retail prices in the market as on 1.1.2014( average prices of 8 Cities in the country) substantiated by the documentary evidence of Cash bill obtained from the concerned vendors. As on 1.12016, the minimum wage work out to Rs. 29339, rounded off to Rs. 30,000. 6. The 5th CPC adopted the rate of growh in the economy ( as reflected in the increase in the per capita net national produce at factor cost) over a period of ten years to arrive at the increase required to be made to arrive at the minimum wage. The per capita NNP at factor cost registered an increase of 65.28% over a period of ten years in 2013-14. If we apply the same percentage to the emoluments (Pay +DA) as on 1.1.2016 (assuming that DA will be 125% as on that date), the minimum wage as on 1.1.2016 for an MTS will have to be Rs. 26030, rounded off to Rs. 27000. 7. In para 4.2.9 of the report, the Commission has given a table depicting the percentage increase provided by the successive Pay Commissions, according to which the 2nd CPC had made a paltry increase of 14.2%. The 3rd CPC gave a rise of 20.6, 4th 27.6, 5th 31.0 and 6th CPC 54%. While the per centage increase had been in ascending order all along, the 7th CPC has sought to reverse that trend ostensibly for reasons unknown. It is was the meager increase of 14% provided for by the 2nd CPC that triggered the volatile situation in the civil service and led to all India strike encompassing all employees which lasted for 5 days in 1960. We do not know whether the 7 CPC really intend to create such a scenario once again. Promotion from one cadre to another is a rare phenomenon in government services especially in lower grades. If one to be awarded only an increment amounting to 3% of pay, it might not become a sought after affair and will in fact act as a de-motivating factor. This apart, in most of the Govt. Departments, promotion is followed by posting to a different location. Those who are posted to unclassified cities or from Metro cities to towns will financially suffer due to such mandatory transfer on promotion. This is because of the fact that the rate HRA, Transport Allowance etc vary from one station to another. The financial benefit on promotion must be, therefore, at least two increments i.e. 10% of the pay. 8. To remove existing anomaly, the annual increment date may be 1st January for those recruited prior to 30thJune and 1st July in respect of those recruited prior to 31st December. (f) Fixed medical allowance for those pensioners not covered by CGHS and REHS to be increased to Rs. 2000 p.m. The 7th CPC has recommended to abolish large number of allowances and interest free advances without going into the exact relevance in certain departments where the allowances are provided for. The allowances which are stated to be subsumed and which are clubbed with other s also require consideration. If these allowances are withdrawn, it might affect adversely the very functioning of the Department itself in certain emergent situation. Of the allowances mentioned in the report for abolition, we have mentioned hereunder those pertaining to civilian employees which require to be retained. (a) Retain the rate of house rent allowance in place of the recommendation of the Commission to reduce it. (h)Qualification Pay to be retained. (l) P.O. & RMS. Accountants special allowance. 19 50% of the CGEIS premium to be paid by the Government in respect of Group B and C employees. 22 Full pay and allowances to be provided for the entire period of WRII .